Members of the first Solvay Conference, in 1911. Left-to right: Standing: Robert Goldschmidt, Max Planck, Heinrich Rubens, Arnold Sommerfeld, Frederick Lindemann, Maurice de Broglie, Martin Knudsen, Fritz Hasenöhrl, Georges Hostelet, Edouard Herzen, James Hopwood Jeans, Ernest Rutherford, Heike Kamerlingh Onnes, Albert Einstein, Paul Langevin. 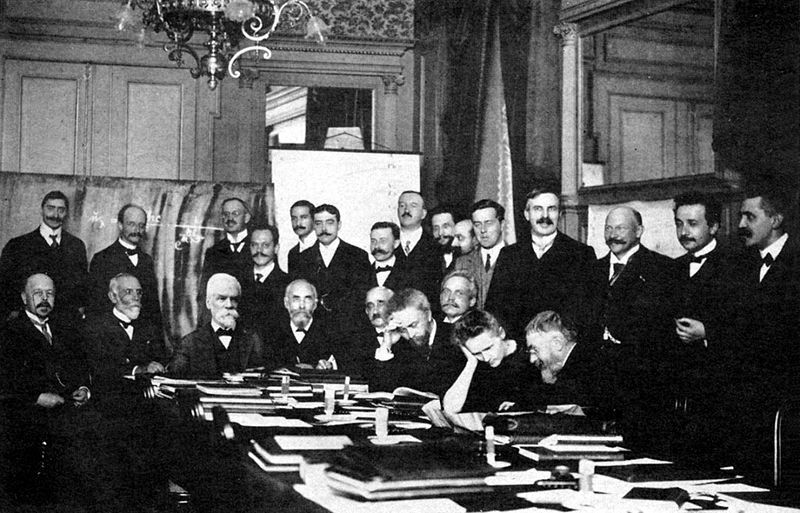 Seated: Walther Nernst, Marcel Brillouin, Ernest Solvay, Hendrik Lorentz, Emil Warburg, Jean-Baptiste Perrin (reading), Wilhelm Wien (upright), Marie Curie, Henri Poincaré. Unlike Sheldon, I have not Photoshopped anything onto it. That’s not to say the above photo isn’t doctored, however. See the fellow with the gray beard sitting at the table? That’s Ernest Solvay, the Belgian Industrialist who sponsored the conference. He couldn’t be present for the photo, so his head was pasted over that of a stand-in. I heard they did it with Photoshop running on a Windows 11 laptop. Solvay made his fortune by inventing a manufacturing process for sodium carbonate, a process used to this day. In the Solvay method, seawater was mixed with limestone to produce soda ash, the common name for sodium carbonate. Among its many uses, soda ash “softens” water; it takes up the magnesium and calcium found in “hard water” that would otherwise limit the washing action of detergent. Soda ash is used to reduce the acidity of food without using harsher chemicals, such as lye. In an important industrial process, soda ash is used to coat raw pretzels, which gives them their nice brown skin upon cooking. Solvay dedicated much of his fortune to philanthropy, including seminal meetings among the leading luminaries of physics. Such was the origin of the first of these, the 1911 Solvay Conference. So what happened at the Solvay Conference? I’ve consulted my go-to source on particle-physics history, the book Inward Bound, by Abraham Pais. Setting the stage for the conference, Ernest Rutherford, had just completed his famous experiments indicating that an atom has a dense central nucleus surrounded by electrons located thousands of times farther away than the radius of the nucleus. In his lab, electrically charged alpha particles scattered backwards from a gold foil target, indicating they were encountering a dense region of electric charge. 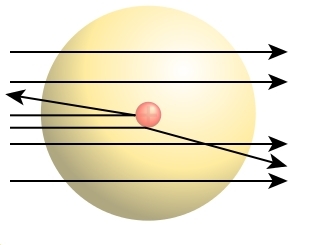 Rutherford's alpha particles could scatter backwards from a gold atom. This led him to realize there had to be an atomic nucleus. Rutherford was in the audience, having already realized that his alpha particle scattering experiments showed exactly this. But he said nothing. And yet to this day Rutherford is credited with the discovery of the atomic nucleus. As well he should be, since he designed and interpreted the experiments that proved it true. Of course Marie Curie did wonderful other experiments in her own right, elucidating the nature of radiactivity. Both won their own Nobel prizes. Here’s a little Inside-Hollywood information. The boards Sheldon used tonight were not set dressing; they were a prop. Most weeks, I send the material for the whiteboards to the set-dressing department. They take care of furniture, various decorations on the set–and for our show–the white boards. But tonight was special. Sheldon touched a board. Anything an actor touches automatically becomes the purview of a different department–the properties department. So these particular boards were props. If you take a closer look at these props, you will see he has Bayes’ theorem up there. Perhaps that’s because since he is studying the meaning of some genetic tests. Here’s a question about medical tests, showing you must know Bayes’ theorem to understand what yours mean. Suppose you take a blood test for a disease that only has a small chance of error: Say 99% of the time the test identifies the disease when one is present. But also rarely, say 5% of the time, it will say you have the disease when you don’t. Question: Your test comes back positive; what is the probability that you have the disease? You still need to know the probability that the disease occurs in your population and apply Bayes’ theorem, the theorem on the board. It is straightforward to see. If we test you for smallpox with such a test, a disease nobody on Earth has, then 1 time in twenty (5%) you will be positive for smallpox, even though we know you don’t have the disease. Now if only 0.5% of the population has the disease and you test positive, then there is still over a 90% chance you don’t have the disease. This is why your doctor does not give you the tests that would have found problems early…it would cost too much in all those who were identified as false positives. From your insurance company’s point of view, you aren’t worth it. As for the family tree on the board, that is official genetic counselor notation. My sister Linda just graduated with a master’s degree in genetic counseling and she gave me all the symbols to use, including that Sheldon has a fraternal (“dizygotic”) twin, Missy. So for this episode , your consultant consulted a consultant. The Big Bang Theory, gives us not just toilet humor, but a contemporary physics controversy, too. Tonight Raj worries about how Aquaman uses his toilet. How can he flush it underwater? 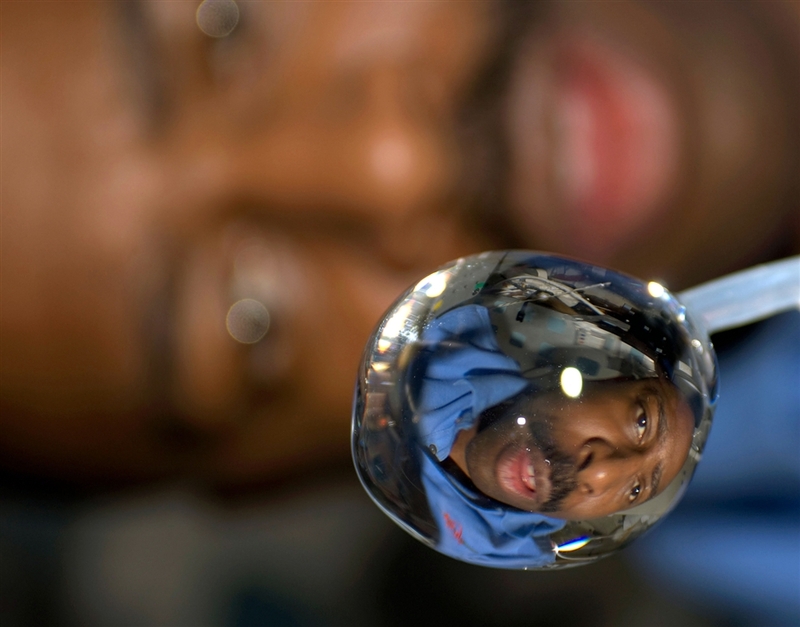 Water sticks to itself, as shuttle astronaut Leland Melvin can see. Blobs of water float around the space station, without diffusing into a mist, but remain cohesive. Is this cohesion at work in a toilet flush? 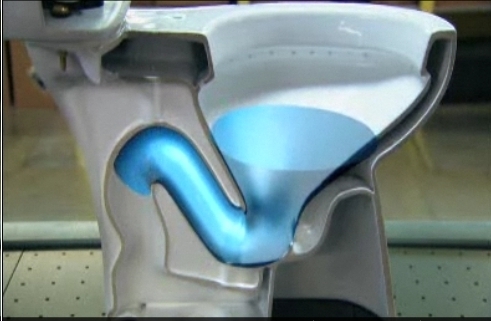 The most common toilet in North America is a spectacle of physics, the “siphoning toilet”. Using a design honed for over two thousand years, here’s how the toilet works: Water sits in the bowl of the toilet just below the level of the top of an S-shaped curve in the drain pipe behind the bowl. This water does a nice job of sealing off the toilet from the noxious gases in the sewer pipe as well as keeping the bowl tidy. When you push the tank handle, water rushes into the bowl rapidly, pushing a column of water through the entire S-shaped curve. The modern explanation is that gravity and the cohesive properties of water do the rest. Once there is a continuous column of water through the S curve, the water farthest along is falling down to the sewer. It is sticking to the water behind it and pulls it along, making the familiar whoosh sound. This flow continues until there is a break in the contiguous column of water. That break happens when the tank empties and the water in the bowl is low enough to allow air in and separate the water from itself. That is why the whoosh is followed by the gurgle. It’s the air breaking up the column of water in the S-shaped pipe. The process finishes with the water in the bowl just below the level of the top of the S-shaped pipe, ready to serve another day. Gravity pulls the water (and what’s in it) down to the sewer. “Wait,” some might object. None of this explanation used the effect of atmospheric pressure to explain the siphon. Many of us learned that it is atmospheric pressure pushing the water over the obstacle–not cohesion pulling it along. If the cohesion argument were correct, why is the maximum height of an obstacle the siphon can pass equal to 34 feet of water, the typical atmospheric pressure? Even the ancient Greeks knew they could not siphon water out of a mine farther than 34 feet vertically. You can even calculate the maximum height of a siphon using Bernoulli’s equation and atmospheric pressure. These sure makes it look like atmospheric pressure is a key player in the operation of a siphon. Here’s what I suspect the cohesion camp would say is happening: as the water gets higher and higher, its pressure decreases until it actually boils at room temperature. The presence of water vapor breaks the cohesion of the column of water. The argument that it is the cohesive properties of water, and not atmospheric pressure, seems to rest on a discussion of siphons in vacuum. It’s been claimed that a siphon will work even in a vacuum which would certainly remove atmospheric pressure from the explanation. So unlike Aquaman, Vacuum-man would have no problem using his toilet. (Take that, DC Comics!) But I am skeptical of this particular claim. Since water has no liquid state in vacuum, I don’t see how a vacuum siphon can even exist. The experiments the proponents of cohesion point to only put the water in the tube under vacuum, not the reservoirs. So this is not the proof that is claimed. A physicist in Sydney shows us a pretty convincing experiment that atmospheric pressure pushes the water over the obstacle. I have not yet finished thinking about if his experiment could be explained with a cohesion argument. At the moment, I don’t think either claim is proven…whether atmospheric pressure pushes the water up to the height of the obstacle, or whether the cohesion to water already past the obstacle pulls it along. To be a meaningful question, it must be possible to answer experimentally, at least in principle. Perhaps by studying under what conditions fluids of different cohesiveness (“tensile strength” to experts) and boiling points break the siphon the answer will be revealed. If no experiment can distinguish the two cases, even in principle, it may turn out to be just semantics. I suspect the latter. On a molecular scale, the cohesion force (created by an imbalance of electrical forces on water molecules) and the pressure force (created by an imbalance of electrical forces on water molecules) seem to me to look the same. But Aquaman is not from North America, where siphoning toilets are ubiquitous. He is from the sunken continent Atlantis, which must have evolved their own toilet technology. If a siphoning water toilet were flushed where would the water go? It would not work if the water went back directly into the same ocean. If sent elsewhere, then the toilet would continuously flush forever. But that would eventually drain the ocean. Another possibility would be to make the toilet operate with a denser fluid, such as glycol, or sulphuric acid (don’t splash). But this would only work if Aquaman somehow voided himself with fluids and other material denser than sea water, so it would not float away before flushing. Alas, some important questions are beyond the scope of even physics.